Detail King’s Master Blaster Car Dryer by MetroVac will allow you to dry your entire car without ever having to touch it! 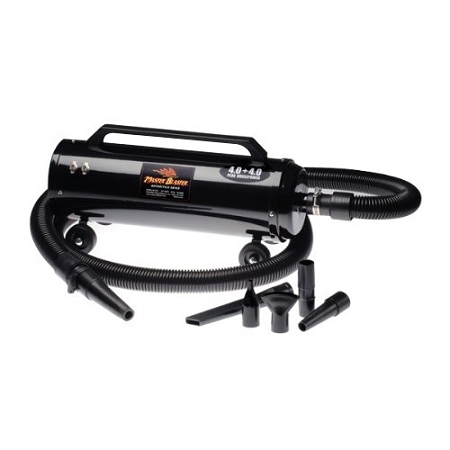 The Master Blaster Car Dryer by MetroVac produces a powerful stream of air that will force water from your vehicle’s finish and every crack and crevice. Made in the USA and of all steel construction the Master Blaster features two 4 horsepower motors that will to spin both two fans up to extremely high speeds to discharge warm, filtered air at a speed of up to 58,000 feet per minute!! Water will effortlessly roll off the surfaces and be purged from all the vehicle cracks and crevices. This will save you drying time Big Time! This powerful blast will blow all the water effortlessly from your finish and eliminate those miserable post washing drips that always seem to appear beneath the mirrors and door handles. Each of the two fans are independently controlled by externally mounted switches which will allow you to adjust the air speed and temperature. Why should you use air to dry your vehicle? It’s Simple - it's much easier, more effective, and quicker than traditional towel or squeegee drying! Using a high speed air dryer means you will spend less time looking for all those water drops and get through your washing procedure faster. The high speeds will blow water from the hidden cracks and crevices so they don’t spot your paint after the first drive. The 10ft long hose and easy rolling casters on the body of the Master Blaster make it easy to get to all sides of your vehicle with minimal effort. Do you get that horrible rusty look on your high performance brake rotors after a car wash? You can prevent it completely by using the Master Blaster to dry them before they have the chance to turn into a rusty mess. Master Blaster users report over 80% time savings in their drying procedure and the less time you spend drying is more time you can spend driving and enjoying your ride! This item ships directly from MetroVac usually within 24-48 hours of your order. So if you have included other items in your order the Master Blaster usually arrives a few days after the rest of your order.